And yet another chapter in the continuing saga of "The Case of the Shrinking Pillow" (see what I did there?). Last night I made it through an entire eight-hours with a full pillow all to myself. Can you imagine? I thought I was home free. Then I woke up to feed Cosmo and went right back to bed. 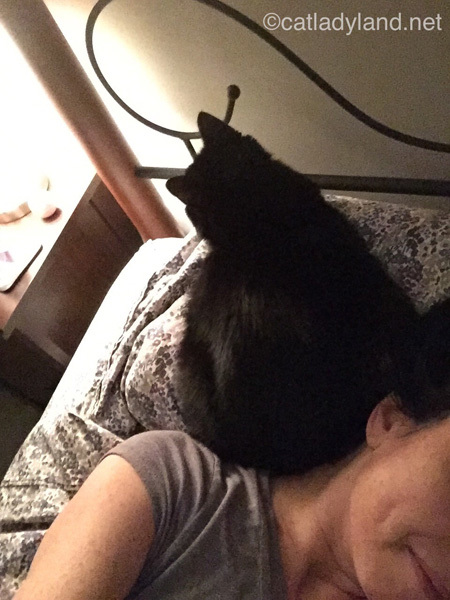 When I awoke an hour later, my pillow had been inhabited by a large cat-loaf wearing a tuxedo. I didn't realize pillow parties were such fancy affairs! Tomorrow I'll wear a taffeta ball-gown to bed.